As founder of Coinstar, I invented the machine for a single purpose. I envisioned a world where, with my advanced coin-sorting technology, people could come into a supermarket, place their coins in the machine, and just seconds later, walk away with either cash or credit. Coinstar technology is incredible, and it has tremendous power and potential, but in the years since I invented it, I’ve begun to worry about what could happen if malevolent people began to use it for their own twisted purposes. Every night I lie awake, worrying about the possibility of Coinstar technology falling into the wrong hands. Sadly, when I created this wondrous new Coinstar machine, designed to free humanity from all its debilitating coin-sorting needs, I also created a machine that, when put in the hands of the wrong people, could allow some of the most depraved lunatics to count pennies, nickels, and dimes at a rate previously unknown to humankind. Sometimes in the middle of the night, I bolt upright in my bed, sweating through my clothes, tormented by visions of a dark world where the world’s most evil men and women have gained access to a device that can sort whatever coins they want, even Canadian pennies, at a terrifying rate of seven coins per second. Coinstar is an affront to nature, and surely we as a species will all pay the price for our hubris. I cannot sleep. I cannot eat. I am perpetually haunted by the idea that an evil entity like ISIS or Boko Haram could enter a Walmart with entire wheelbarrows of assorted change, and then leave in under eight minutes with a stack of cold, hard cash. Think of what these terrorists and criminals could achieve if they no longer have to sort their coins by hand and can instead harness the efficiency of my ruthlessly powerful coin-counting machine. The hours they would have previously spent organizing their loose change could be spent plotting violent attacks on innocent people. And when this inevitably happens, I will have blood on my hands. We all will. Back when I first created Coinstar all those years ago, I was so busy trying to see if I could sort coins by weight that I never stopped to think if I should. I was blinded by my ambition. The first time I dumped a bucket of coins into my glorious, terrifying prototype and in just a few short minutes received a voucher for the exact cash equivalent minus the 11.9 percent processing fee, I felt like a god. But I was nothing but a power-mad fool. I understand now that humans were never meant to sort coins in a matter of seconds. It’s perverse. Coinstar is an affront to nature, and surely we as a species will all pay the price for our hubris. I’ve realized—far too late—that a world where humans are forced to painstakingly put coins into sleeves by hand and drive them to the bank to have them counted is better than a world where anyone at all, including cold-blooded killers and agents of destruction, can sort coins using a lightning-fast automated kiosk. As I pray at the foot of my bed each night, I beg God to forgive me for the coin-related mayhem that will soon consume the world once Coinstar is inevitably used for evil instead of good. 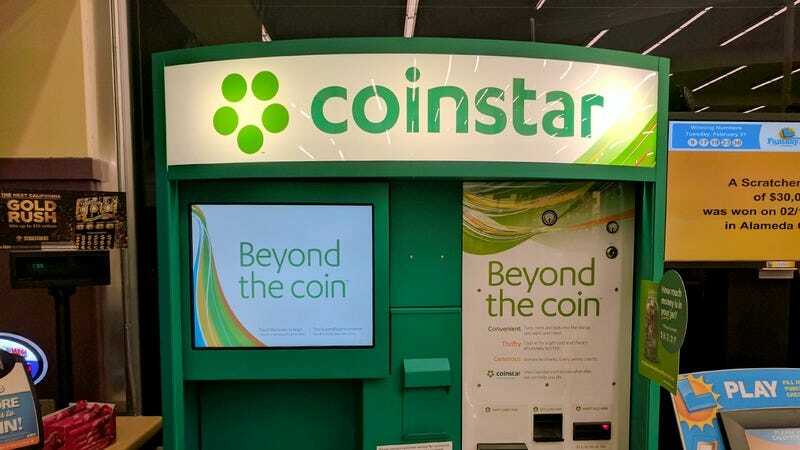 One day, as the last of humanity witnesses the violent collapse of civilization, they will look back on the terrible day that Coinstar was born into the world and recognize that this was the beginning of the end. And for that, I am deeply, truly sorry.